Susan Elizabeth Montanye died in her home on October 23, 2015, in Mulberry, KS due to a house fire. She was 59. Ms. Montanye was born on February 15, 1956, in Pittsburg, KS, to Charles and Melba Montanye. She attended Mulberry and Arma schools and graduated from Northeast High School. 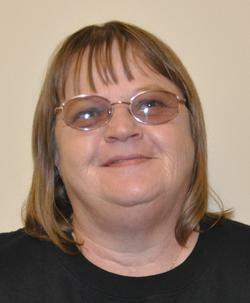 She went on to graduate from Labette Community College with a certificate in Respiratory Therapy in 1988. Ms. Montanye currently worked as a Respiratory Therapist at Barton County Memorial Hospital. She was also part owner of the former Dixon’s Mini Mart/Big Little Mart in Burgess, MO. Ms. Montanye currently served on the Mulberry City Council and had also served in previous years. She served on the Mulberry homecoming committee and was also a member of the American Legion Auxiliary Post # 176. She had loved volunteering during the Summer Food Program as well. She always made people laugh and had a heart of gold when it came to family, friends and animals. Ms. Montanye is survived by three daughters: Michelle Bozich of Bentonville, AR, Karri Johnson of Fletcher, OK and Tricia Montanye of Olathe, KS; her 2 brothers: Chuck Montanye of Arma, KS and Joseph Montanye of Mulberry, KS; and four grandchildren: Kendra, Dayton, Arthur and Kyle. She is preceded in death by her mother, Melba; her father Charles; and her sister Mary Margaret. A memorial service will be held at 11:00 a.m., Thursday, October 29, 2015, at the Mulberry Citizens Center. All family and friends are welcome to attend and celebrate her life. Ms. Montanye will be buried in a private ceremony at the Rosebank Cemetery in Mulberry. In lieu of flowers, please donate to the City of Mulberry for a memorial in her memory. Memorials may be left at or mailed to the Brenner Mortuary, 114 East 4th St., Pittsburg, KS 66762. Friends may leave condolences online at www.brennermortuary.com. Arrangements are under the direction of the Brenner Mortuary, Pittsburg, KS.